Browsing through Keith Collantine's photographs of the Goodwood Festival of Speed, I came across his picture of the Tyrrell 012, beautifully prepared in its original 1983 colors and bringing the memories flooding back. In those days it was the look of the car that made it stand out for me but it is also a highly significant design that stands between one era and and another. The 012 was one of the last F1 cars to be designed for a normally aspirated engine before the turbo onslaught. The turbo engines had been gaining in power and reliability for years and Keke Rosberg's 1982 championship in a Williams-Cosworth, stolen while all the rest were squabbling, was clearly the last for the old V8 atmo DFV. By the end of that year the turbos were estimated to be giving 200 bhp more than the Cosworth and those teams who had not yet acquired a contract with a turbo supplier were clearly in deep trouble. Ken Tyrrell and his designer, Maurice Phillippe, had no prospect of a new engine deal and so had to do the best they could with the old faithful Cosworth. Their previous car, the 011, had proved quite useful and, in the hands of Michele Alboreto, even won the Detroit GP in 1983. But the 012 was a much more radical design, taking the Cosworth-powered cars to their ultimate expression. Carbon fiber was used extensively to keep down the weight of the car, sidepods were eliminated, the radiators being either side of the engine and external dimensions reduced to the minimum. Take a look at the driver in the photo above and see how he appears to our modern eyes to be too big for the car. Notice, too, how the sides of the cockpit are cut away so that we can see his shoulders, giving the car a look of those monsters of the fifties when the drivers' elbows sawed away outside the bodywork. Perhaps the most striking thing, however, is the short and dainty nose. F1 cars have grown long protuberances since then, forced by the demand for crash protection and aerodynamics - to see how insignificant the noses had become at the end of the ground effect era horrifies us and explains why ankle and leg injuries were the inevitable result of crashes in those days. But to me, the 012 is beautiful. It has the same boxy, straight-edged appearance of the Williams FW08 of 1982, but this is much more tastefully executed in the Tyrrell. The FW08 was a brick; the 012 is a finely-crafted sculpture. This impression is probably enhanced by the color scheme, that aggressive Benetton green harking back to the days when all British cars were green. It all amounts to a simple and purposeful look that makes our modern F1 cars look fussy. The car was effective on the track, too, only early reliability problems preventing the team from scoring a hatfull of points. It was during the 1984 season that the axe finally fell. Suspicious of the car's performance against teams with a huge power advantage, the FIA moved in to investigate after Martin Brundle's superb second place in Detroit. Tyrrell were using a water tank to inject water into the combustion chambers and so produce a little more power - but, more importantly, filling this tank brought the car up to the legal minimum weight limit, thereby allowing the car to run most of the race considerably lighter than the rest. It was just enough to allow the team to run close to the competition and to beat them on the tighter circuits. 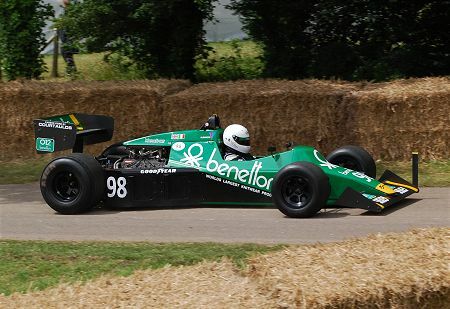 Tyrrell were at first banned from the rest of the season, later being allowed to continue but without the possibility of points. The damage had been done, however, and the 012 spent its last few races near the back of the grid, a poignant reminder of the end of an era of Cosworth victories. Those last few years of the struggle between the haves and the have-nots had been desperate times, with the Cosworth teams taking ingenuity to new heights as, one by one, their advantages were taken away from them. First went the skirts that ground effect depended upon so utterly, then the fluid top up regulations were changed so that clever tweaks like "water-cooled" brakes and water injection could no longer offer a saving in weight. The turbo era was one of massive power outputs, frightening speeds and an eventual return to normally aspirated engines. Aerodynamics were to become the essential ingredient to car design and it is somehow fitting that the team that introduced the signature of the modern F1 car, the raised nose, should be Tyrrell, last of the innovators of a previous time. Their final years were a sorry tale of decreasing performance and lack of cash but they should be remembered, not only for the great Jackie Stewart years, but also for the 012, the last gasp of the constructors who thumbed their noses at the might of the manufacturer teams. Amazing what one can see in a photograph, isn't it? One other thing I got from this photograph - a sense of what might have been for Tyrrell. They lost the Benetton sponsorship to Alfa Romeo and the clothing company ended up buying Toleman. After that last win in 1983 Tyrrell never won a Grand Prix again. But with long-term backing from Benetton perhaps things might have been different. True, Underdog - and at Monaco, Bellof was gaining on Ayrton as fast as Ayrton was gaining on Prost when the race was stopped!